Posted on December 13, 2017 December 15, 2017 by KeithGPosted in Blog or Die Entries, Contests, Guest Appearances by...Tagged Comics, Fiction, LIU Atlas, Poetry, Story time with Werewolff, Waffle for a thousand words, What's the story?, Writing. Thanks for this glimpse into your craft. Well written too, naturally. Reading this, it’s clear there’s a knack to crafting prose that keeps the reader engaged and you very much have it. As well as too many tyres. Tyres will take over the world. Cheers Nick, and yes, yes they will. Interesting read. I know you said that you were skipping over “the intricacies for writing a good story” itself, but what about the planning stages for a project like this? I would think that has to be a very important part too, so that the story doesn’t loose steam or go astray. To me, Bart De Dobbelaer is one of the most captivating story builders around. I think he’s taken both approaches in the past (organic vs planned out). His humorous adventures of “Clumsy Pete” were a bit of organic story telling, while I think his later projects were more planned out (or at least that is how I perceived them). PS – I’ll pass on the Vegemite, but “Moreton Bay bugs” are the best! Thanks Ted, but I’m afraid there’s no exact answer when it comes to planning out stories. Like you say, some writers have it all planned out (both stories and builds) months in advance, whilst others do simply dive right in and make it up as they go along. In all honesty, there really is no ‘right way’ to do it. I personally plan things out quite a bit, but leave the more subtle things (like dialogue) until I’m actually writing it up which, for me, creates a more organic flow between the characters. And yes, Bart’s work is indeed some of the best story-telling in the Lego medium I’ve come across as well, and I agree that he’s most likely adapted the planning process to better fit in with the story itself. You’ve hit the nail on the head there! The one thing that has always deterred me from making a Lego story is picture-taking. I’m too lazy! That must be it! Lately, I’ve been absorbed by these Iron Builder-style one-hit-wonder builds. One picture, one story, ten seconds on the viewer’s part, all the likes! Yahoo! But when it comes to laboriously setting up for each shot and taking the picture, I just don’t have it. I can’t figure out what to blame this on. I can write a story just fine. In fact, I have 10 abandoned, fairly lengthy chapters of Insurgency story still saved on my tablet. I built a set for the first story, but somehow, when it came time to execute, I didn’t carry through. I’ve noticed a quality drop with some builders’ photography, where the appeal of the pictures decreases as the number of pictures grows. Maybe that’s my hangup, since I’m always trying to improve my photography techniques. Again, I can’t really fathom how difficult it is to set up, photograph, set up again, take more pictures, go back and fix some pictures, then organize, edit, and finally post with text. It’s a dozen extra steps that most builders don’t even worry about, and makes the hobby more than just a casual experience. Even when you started storytelling, the pictures were rather low-quality, but both those and the builds have improved markedly as you continue to turn out new stories. And I’m constantly amazed at the rate at which you and other storytellers publish chapters of the story. I think I left Risa a few seasons ago at the barber shop, because I couldn’t keep up and regrettedly haven’t picked up my slack since then. It could be that goes hand in hand with my laziness to actually create a story-driven MOC. But again, I feel like my resistance to the storytelling aspect of the hobby has caused me to miss out on a quintessential Lego experience that is deeper and more meaningful than the day-to-day build & post mentality promoted by sites such as Brickly. You’re a Lego legend to me, Wolff. I’m excited to see what lies ahead for you, and hopefully some day soon I can get back ahead of the curve of your storytelling. Between the Insurgency and Dennis Price’s GK, I’ve missed too much Lego lore in my time in the hobby. Keep it up, mate. Wow, thanks VA! Very kind words from a fantastic builder like yourself! Yeah, like I said, story-building isn’t for everyone, and it is indeed the picture taking that takes up the most time during the making of each of my episodes, sometimes up to a week, depending on the episode’s length. However, I personally love doing it, and that’s whats kept me doing it. When you’re building a scene or a set, you are literally building the world! I feel, as you said, it can give the model a deeper meaning. Does it mean it’s necessary? No, not at all, and there’s plenty of builders out there that barely use a write-up at all, whilst producing some of the greatest models on the planet. But in my mind, I always think that every model has a story waiting to be told. It doesn’t have to be long, or terribly complex, but it’s there nevertheless. And that’s what keeps me going. Fun article. I have come up with stories for some of my builds, but usually don’t. I didn’t figure anyone really read them anyway… I guess I was wrong. Ha ha! I hadn’t though of it that way! Though I will say there is plenty of MOC’s that do fall into that category. That’s why I believe the MOC and story have to be securely linked together. Spitting out a ton of words that might be a great story, but don’t relate to the build, will ultimately leave the wrong impression with readers. Thanks for the comment mate, and if you publish anything else, know that you’ll have a reader here! Thanks for the stick-save. Since what grabs the attention first is the visual (book covers anyone? ), you’ve got to get your foot in the door first before people will consider it worth the time to start reading. You want the scene to be “captivating”, to “capture” people’s attention to think “oh, wow… what’s going on here?”… Not all pictures are worth a 1,000 words. They have to earn it (simply or with details). Look at the published stuff out there. What’s his name, Branden Smith and his Brick Bible. The images are all not a single brick more than is required… but the detail of the narrative is captured. Visual and verbal re-enforce one another perfectly… but also economically. To much detail will slow you down and use up your build time. I reckon that’s Fair dinkum if I’ve ever seen it! The prose floweth! I approve. You and Dennis nailed the problems of telling stories in Lego, no one is expecting to read and they won’t put the effort in doing so in a visual medium. A picture is only worth a thousand words because we have to reduce it somehow. But there is a beauty in itself when the words flow and are mated perfectly to a vision. But our attention spans are the greatest enemy. Ludgonius’ work is brilliant in exploiting this failing. We can all relate to Doog and his episodes are a non-threatening length. Ted is absolutely right in saying that you “gotta hook ’em” with the visuals; but if there ain’t anything behind it, then it essentially is just a dio with nothing more. I think another aspect of Ludgonius’ success is that anyone can enter any episode and not feel lost (granted, for more complex stories one can just go back and get caught up, but even simply blocking out time in the day to do that is a commitment that most are not willing or able to do.) The simplicity of his work in writing is outweighed by his skills in building and photography. He doesn’t add special effects outside cleanup and what is only vital to the story arc. His self editing is truly what is masterful. I think that is where a lot of stories tend to get lost. We all want to create something more to reflect a natural life with countless characters and complications. But complexity for complexity’s sake is self-indulgent masturbation and it drives readers away. I’m not a huge fan of Stephen King, but he wrote a book/bio called On Writing. It is painfully brilliant and a must if anyone is even remotely interested in storytelling. And if anyone can lure readers into an over a thousand page text about a clown that turns into a bug and kills kids, they are a true master of the craft. Great article, Wolff, and certainly something worth exploring further. The Lego community needs more storytellers honing both the crafts. I’ve not read many of the stories, but I’m familiar with a few of the builds. I guess that puts me in the “TL;DR” camp. I’ve tried reading one or two of these before but they tend to bore me. Maybe it’s because I don’t read much fiction and I’ve never been a fan of western fantasy in particular, which seems to be the genre most Lego stories fall into. You mentioned that the build doesn’t have to be complex to be effective, and I don’t disagree with that. But I find with most of these stories there’s a disconnect between the text and the evocative quality of the builds and the emotive potential of minifigures. In many cases I’d rather just be reading the story without the visuals distracting me from my own imagination. It’s really difficult and rare for even the best builders out there to illicit a strong emotional response from a visual alone, so a lot of that burden has to be taken up by the text. I’m a fan of “show, don’t tell,” and I think most of these stories do too much telling and not much showing. I find dialogue to be especially ill-suited to Lego and I found myself trying to ignore the pictures when trying to read through some of the stories featured in the article. Bart De Dobbelaer is a fantastic exception to the norm though, and it’s because he expresses his stories through striking scenes that give context to those static minifig expressions, and with minimalist descriptions and impressions rather than drawn-out dialogue and prose. His pictures, unlike most I’ve seen in this storytelling medium, really are worth 1000 words. He respects that by not diluting them with a disproportionate amount of text. It’s a lot like Kow Yokoyama’s approach to Maschinen Krieger where the story is largely told through models and descriptions that expand the world little by little in digestible chunks that leave you hungry for more, with a focus on compelling visuals. Hayao Miyazaki did this as well with the model kit drawings he used to do, which eventually culminated into the film “Porco Rosso.” It’s this same kind of world-building that’s at the very heart of Lego. Every time you create a work of fantasy, it exists in some imagined world, so a backstory naturally follows whether the creator chooses to share it or not. Then both creator and viewer may start thinking about what else might exist in that world and build upon it. You can see this process in Tim Zarki’s “Sub Apoc” and Tromas’s recent “Neo-Neo-Canada” series. Wow, nobody mentioned my BSG The Next Chapter storyline, seven years in the making on MOCPages. Action, comedy, adventure- what more could you want in an epic LEGO tale? Okay, fine, lesbians; yes, that too! Threesomes? Of course. Showers and hot tubs, homicidal robots, space battles; check, check, aaaand check. It was admittedly a glaring omission, who doesn’t love hot tub lesbians and thrilling space combat? But, perhaps just as importantly, what did you think of the article? I can’t believe you read it and only thought about your own absence. Surely Werewolff deserves s more complete response. Well of course it’s a great article, old Werewolff covers all the aspects of LEGO storytelling. Altogether an entertaining and informative read. But being completely focused on myself and my own glory, my absence from the article was the first thing that struck me. And that I needed to take a leak and get another beer. And stop calling me Shirley! Ach! How on earth could I forget?! I curse myself to be sucked into the dark void of space and be hit by the Galactica at near light speed for my foolish omission! No worries, Dude! It’s all in good fun! Just figured I’d stop by, throw in a few Airplane! jokes, stir up some interest, and get a couple of comments on my story on MOCPages. Thought Dennis might chime in, but he’s probably napping or driving around with his blinker on. Single Sentence Summary: How to craft a well balanced Lego comic. 1. 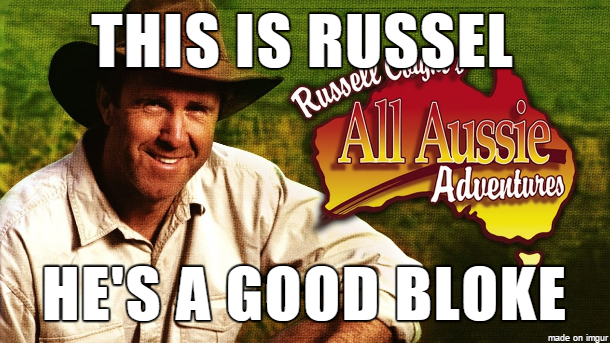 I thought your media choices were masterful, the Stallone meme and slow clapping video made me chuckle, and you turned me on to Russel Coight, I especially enjoyed his gun safety episode. I’ll have to check out more of his work when the dust of the contest has settled, I like his deadpan delivery. I also appreciated that you threw one of your own models into the critical fire in a self deprecating manner, listing all the shortcomings so that the reader had a negative example to go along with all the positive ones. You’ve clearly demonstrated the ability to critique your own work and doing so in the article was a good call. The other models you selected to illustrate your points were solid choices as well. You also nailed just the right balance of images to text, something the other competitors struggled with a bit. 3. I was happy to see you worked a poem into the closing of the article, it fit the theme nicely and was well constructed. It left me wanting to see what it would be like if you made a comic with poetry instead of prose. An illustrated poem, if you will. It also made me nostalgic for the DA2 poetry thread (what was it’s name?…I forget), you really brought more to that game than just your participation as a player on the map. Well done. 1. I was with you up until the final section (TIP 3: Remember That This is a STORY), where I think you kind of lost power to your engine and coasted to a kind of unsatisfying stop. It seems to me that a comic is a 50/50 split between the word and the brick and you gave short shrift to the Lego side of things. Worse, you’re almost cavalier in your dismissal of the topic: “I won’t go into the intricacies for writing a good story as it’s wonderfully subjective (and mostly luck, to be honest)”. The part of your article that focuses on the Lego aspect is also wonderfully subjective, so I was a little disappointed that you didn’t give us any insight into the process of writing or a little comparison and contrast with other builders. You’re skilled at both poetry and prose and I think it was a missed opportunity not to speak about your writing process. I want to know things like: do you outline first, how much do you revise, is there a magic balance between words and images. I know when I’m blogging I have some rough rules about how many images I’ll stuff into an article but how does that work with a comic? I’m not even sure I agree with the advice that you do offer: “The reason why Ludgonious and Marley’s builds work so well is because the story is lined up exactly with what’s being shown.” Does it have to line up exactly? Or is the narrative there to go beyond a literal interpretation of the image. I’m not sure you need to repeat what is visually obvious and I would have like to see some depth to the concept. 2. I think the proportions of the article are a bit skewed, you use well over a third of your total word count before we even get to the first tip. While I enjoyed the personalized back-story that comprised your somewhat bloated introduction, I think you could have whittled it down to something equally effective while devoting more time to the nuts and bolts of your thesis. I was excited to get to the tips & tricks section and you took just a little too long to get there. By no means did it ruin the article, but it was kind of like eating a small but delicious hamburger with a giant bun. I would preferred to see a deeper dive into each of the tips, maybe with more concrete examples of what to do and what not to do. By the time the article ended it seemed like you barely scratched the surface of the topic and you gave us only a tantalizing hint of your deep seated knowledge of the comic form. I didn’t come of the away from the essay feeling like I had a better understanding of how to make my own Lego comic. 3. The following line troubled me “I’ll go to the grave thanking Keith, Ron, Michael and Matt for Decisive Action 2, for providing the opportunity for a young scamp like me, with zero experience, to join the world of online MOCing.” Although I’m incredibly flattered and I appreciate the sentiment more than you probably realize…reading about myself even for that short blurb really took me right out of the article’s flow. If you’re going to mention the host, better to do so in a humorous fashion where you’re taking the piss out of me instead of slathering on the praise. Even though you’d probably think I live for the praise, it actually makes me feel a little uncomfortable in the context of the contest. To some of your audience it no doubt appears that you’re sucking up to the judge to improve your score, and that’s never a good look. I had the same problem to an even greater extent with Nick’s essay on DA, which reads as a love letter to the judge. *Also…you didn’t answer a few of your comments and I like to see full engagement from the writers. It wasn’t listed as mandatory, but it’s always good form. ** I will re-post this review along with the rest of your competitors when the final results are issued. Regardless, thank you for the praise as well! However, I think the biggest thing that pleased me about this review is that I got to introduce you to one of Australia’s greatest TV legends. My mates and I have spent way too long watching All Aussie Adventures, so I’m glad that you’re liking it too! Though Russel’s dancing is nothing. You should see my brother doing the boot-scoot. It’s quite the…interesting sight. Pingback: The Culling of the Flickrsphere or How SmugMug Changed a MOCer’s Refuge.